In last month’s column, I discussed how accredited online MPA programs help build policy capacity and community development in rural communities. This month, since PA Times is focusing on social media and administration, I would like to continue my focus on the use of technology in community development by discussing social medial and local community development. I’ve asked my colleague Dr. Roberto Gallardo to join the column to discuss our research on local government Internet usage. Social media platforms are often referred to as Web 2.0 tools for governments. Social media platforms include sites such as Facebook, Twitter and YouTube along with other communication tools, like blogs. According to a review of the social media literature in public administration, citizens can use social media sites to generate user content and comments, create an online identity and build networks—three tools that can be used by community planners when developing local economic visions. The literature on social media and public administration is mostly still in the normative stage, focusing on how social media can help governments communicate with their citizens. Most of the empirical research on Web 2.0 has focused on describing the services being offered by governments. In a 2011 report, researchers at the University of Illinois at Chicago found that the 75 largest cities in America were actively using most major social media platforms. Among the cities, 87 percent reported using Facebook and Twitter, a huge increase from an earlier survey done in 2009. It should be noted that much of this research on describe social media usage by local governments has focused on cities with large populations, not rural and/or small to medium sized communities. When it comes to empirical studies examining the efficacy of social media in public administration, social media does not always help local governments communicate with their citizens. In a 2011 study, Hand and Ching examined Facebook sites of local governments in the Phoenix area and found them to have little interactive communication between citizens and the government officials. However, other local governments have had success at using Web 2.0 to solicit public engagement and offer more effective services. For instance, Brainard and Derrick-Mills detailed how an effort by the Washington, D.C. Metropolitan Police Department to engage the public in online discussion has been successful. Given the conflicting empirical findings, it is important that local governments closely follow best practices in order to have effective communication through social media tools. Maintain secure sites for their citizens. Produce communications that are both relevant and important to their citizens. Provide public officials with clear guidelines regarding what is and is not acceptable conduct and comments on the sites. Fairfax County, Virginia has a model social media policy that achieves these goals. For instance, the county will remove posts by citizens if they contain: vulgar language, personal attacks, discrimination, spam, copyright infringements and statements that advocate illegal behavior. In recent research, we surveyed a nationwide sample of municipal clerks on how local governments are accessing and using the Internet. Questions included ones seeking to know the method of Internet access, the types of services used internally and the state of local government websites and social media. The research is ongoing, but currently, 145 municipal clerks have completed the survey. Most of the cities in the sample are using social media often, in particular Facebook and to a lesser degree Twitter. As can be seen in the figure below, most cities are using Facebook (close to 80 percent). 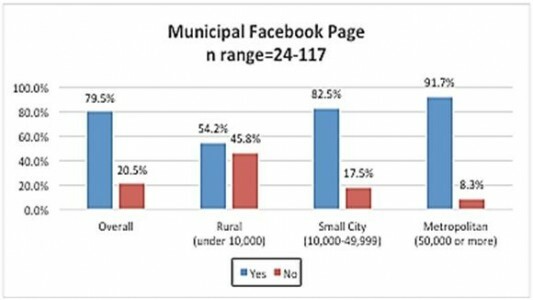 Out of our preliminary sample, rural municipalities are the least likely to have a Facebook page, but even a majority of rural cities maintain an active site. 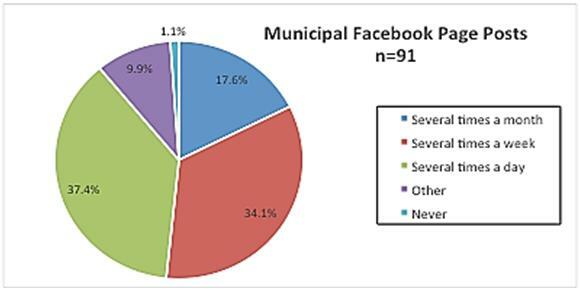 Figure 1: Does your municipality have a Facebook page? In order to improve communication with citizens, best practices call for social media sites to be updated often by organizations. The pie chart below shows how often municipalities in our survey update their Facebook pages. The municipalities use their Facebook site often, with a significant majority updating their pages at least several times per week. Figure 2: How often is content shared on your Facebook page? Social media can be used for one-way communication, such as sharing information and planning the logistics of community meetings. Social media can be used for two-way communication, such as asking for community input on development visions and particular strategies. Social media can be used to implement development visions by helping to maintain public involvement throughout the planning process and by keeping the community focused achieving development strategies.